Guinness Truffles are rich homemade chocolate truffles with a hefty dose of Guinness mixed right in. They're perfect for any beer lover! The dark, fruity taste of the stout is wonderful when paired with semi-sweet chocolate. I like to top mine with something salty--a pinch of pretzels, crushed potato chips, peanuts, or flaked sea salt. Pour the bottle of Guinness into a medium saucepan and place it over medium-low heat. Bring it to a simmer, and let it simmer until it reduces down to 1/2 cup. The time will vary depending on your stove and pan, but for me it took about 30 minutes. Check it periodically while it simmers by pouring it into a measuring cup to see the progress. When it is reduced to 1/2 cup, remove it from the heat. Pour the cream into a saucepan—the same saucepan you used for the Guinness is fine. Place the saucepan over medium heat, and bring the cream to a simmer. While it simmers, place the chopped semi-sweet chocolate in a medium bowl, and pour the hot Guinness on top of the chocolate. Once the cream comes to a simmer, pour it over the bowl of chocolate and Guinness. Wait 1 minute to allow the heat to melt the chocolate, then whisk everything together until the chocolate is melted and the mixture is smooth and satiny. Add the unsalted butter and whisk it in. Press a layer of cling wrap directly on top of the chocolate and refrigerate it until firm, about 2 hours. Line a baking sheet with waxed paper or parchment paper. Pour the cocoa powder into a shallow bowl or pie tin. Use a teaspoon or a small candy scoop to scoop a ball of chocolate and place it into the bowl of cocoa powder. Roll it around a bit until it's coated, then roll it between your palms to make it round, and place it on the baking sheet. Repeat until all of the truffles are formed—you should get about 36 1-inch truffles from this batch. Refrigerate the tray for 30-40 minutes, until the truffles are firm. When you're ready to dip them, place the candy coating in a medium microwave-safe bowl and microwave them in 30-second increments until melted, stirring after every 30 seconds to prevent overheating. When the chocolate coating is melted and smooth, use a fork or dipping tools to dip a truffle into the melted coating, then remove it and let the excess drip back into the bowl. Set the truffle on the prepared baking sheet and, while the chocolate is still wet, sprinkle the top with a pinch of crushed pretzels, crushed potato chips, sea salt, or your topping of choice. Repeat until all of the truffles are dipped and decorated. 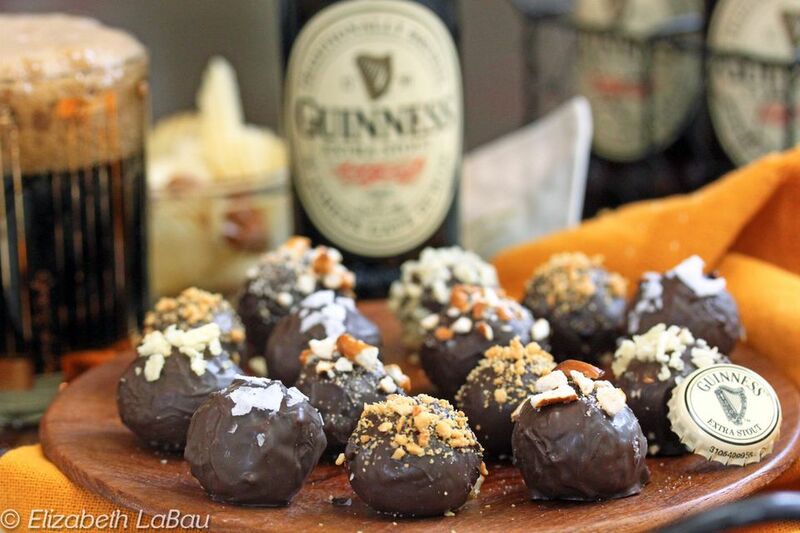 These Guinness Truffles are best served at room temperature. Store extra truffles in an airtight container in the refrigerator for up to two weeks, and bring them to room temperature before serving. Click Here to Learn How to Dip Truffles! Click Here to View All Truffle Recipes! Spice Up Your Life with These Aztec Truffles!